Plus size steampunk, Victorian and fun plus size skirts!! With customizable options, getting dressed up in your favorite designs has never been easier!! 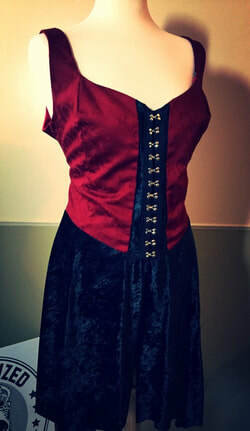 Black velvet and red brocade. Custom options with theme of choice. Click on the picture to see more options. 3 Pieces include top, vest and skirt. ​ All vests have light boning, unless requested otherwise. Click on the picture for more options!! Sleeves or sleeveless, long or cap.